His presence was influential in Springboks registering a 2-1 series victory against England under new head coach Rassie Erasmus in the June internationals. 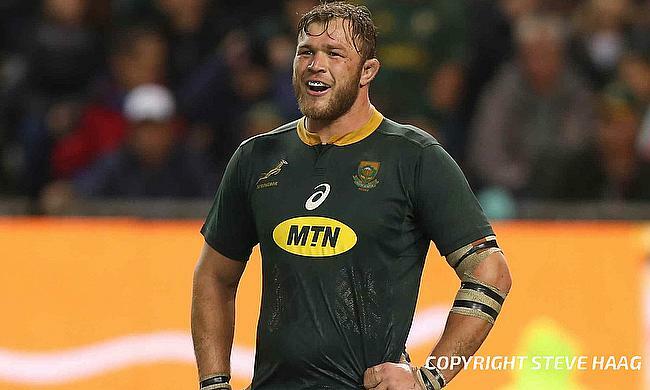 South Africa will be hoping to carry forward the momentum into a crucial Rugby Championship tournament as they would love to get their combinations right ahead of the showpiece event in Japan next year but now they will have to do it without their star number eight Vermeulen. "It will be difficult not to be part of it, but we've got the plan and I've spoken to Rassie about it. I think there's time in the coming weeks where we can work out the exact plan and what we want to do," Vermeulen told South Africa's IOL Sport website. "But it's great being back and being part of a young squad – guys who are excited to play. They love to play, they love to get together. "It's just great to pull this green jumper over your head again. So, I'm really happy to be back, and I hope to be part of the coming Tests. I know it's not going to be in the Championship, but we'll see down the road. "But it's a great team and we've got a great captain [Siya Kolisi], and the guys just need to stick together. "There's a nice phase for us, building towards the World Cup, and if I can be a part of that, then I will be happy to give my 110 percent." Vermeulen came up with a man of the match performance in South Africa's series-winning second Test and with his contract with Toulon coming to an end. There has been various speculations as to where he will be playing his rugby in the near futurse. Reports have surfaced that he is looking at a return back to the province to feature for Bulls, a small stint in Japan before the season ends, and also a more the the Aviva Premiership with Bath Rugby. He has also played for Cheetahs, Stormers and Toulon apart from 42-Test appearances for South Africa previously.